East wall of Church at Ormskirk. Building stone, possibly a memorial stone. 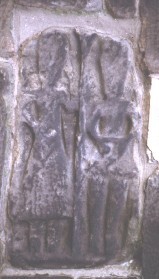 The stone has two figures, a man and a woman, separated by a vertical element.